Print fall calendars, a scarecrow craft, autumn poems, seasonal stories, and fall math worksheets. Look for pairs of adjacent numbers that have a sum of 10. These game boards are shaped like a fall leaves. Cut out the letters in the word "Scarecrow" and rearrange them to make as many different words as possible. This primary level puzzle sheet has primary-ruled lines for grades K through 2. Cut out and rearrange the letters in the word "Scarecrow" to make as many words as possible. This intermediate level worksheet has a scoring system. Grades 3 through 6. Find the words hidden in the puzzle. Word list includes acorn, apple, bonfire, leaves, rake, sweater, and wind. Words are hidden vertically and horizontally. There are no backwards or diagonal words in this puzzle. Build a giant scarecrow with arms and legs that move. Cut out the scarecrow parts and attach with brass paper fasteners. Build sentences with these autumn-themed word cards. 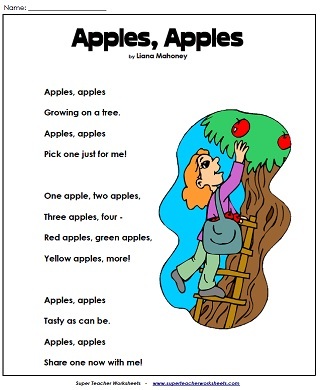 This set includes basic sight words, such as you, this, I, a, the, can, they, we, see. There are also fall-themed words such as apple, school, tree, leaves, and play. Build-a-Sentence: We rake the leaves. Students cut out the word cards and unscramble the sentence. Then they glue the sentence onto the paper and write it. When they're done, they draw a picture. Then sentence says, "We rake the leaves." First students cut out the word cards, arrange them into a sentence, and glue them onto the page. Then they write the sentence on the primary-ruled paper and illustrate. The sentence says, "Let's pick the apples." Jayden doesn't know how his teacher expects him to find every color of the rainbow on their autumn nature hike. There's nothing blue or purple in the woods! Learn about the reason why leaves change their color in the fall! This worksheet includes reading comprehension questions, a writing prompt, and vocabulary terms. An answer key is included. A cheerful poem about the fun things you can do with autumn leaves. Ben visits his uncle's farm to go for a hayride and pick pumpkins, but when Uncle Darrell can't keep the crows away from his corn field, Ben figures out how to make a scary scarecrow. Kendall is raking leaves in his yard and he can't imagine anything more boring. Eli, her next-door neighbor, shows her just how much fun raking leaves can be if you make a game of it. Here is a set of autumn-themed writing prompts on a single, printable page. On this printable graphic organizer, students will write about the splendid sights, beautiful sounds, delightful tastes, and scrumptious smells of the season. This worksheet has a picture of two kids jumping in a large pile of autumn leaves. Students write a creative story to go along with the picture. Count and color the pumpkins on each page. Then cut and assemble the miniature book. On each page, students color each pumpkin the correct color. Book says: Color the pumpkin red. Color the pumpkin green. Color the pumpkin orange. Etc. Solve the basic addition problems and color according to the key at the bottom of the page. All addition facts on this page have addends of 10 or less. This math worksheet has a picture of a squirrel with an acorn. To find out how to color it in, students must solve the basic addition facts. All facts have addends of 10 or less. Subtract and write the answers. Then color the scarecrow illustration according to the key. All problems have a difference of 10 or less. This math picture has a picture of a squirrel eating a nut. In order for students to find out how to color it in, they must solve basic subtraction facts. All facts have a difference of 10 or less. Multiply to find each product. Write the answers to each problem. Then color according to the key at the bottom portion of the worksheet. All multiplication facts have factors of 12 or less. Multiply three-digit numbers by 1-digit numbers. 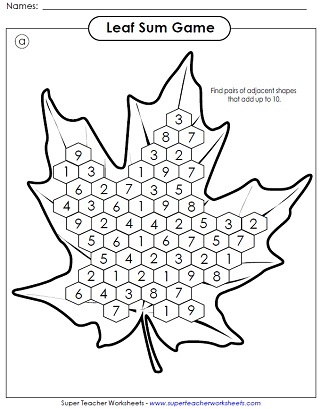 (example: 467x8) This worksheet has two fall-themed word problems and a picture of children jumping in leaves. Write the quotient for each basic division fact. Then match the answers with the color code system at the bottom of the worksheet. All quotients are 10 or less. Find the quotient for each basic division fact. Then use the color-key to color in the picture of the squirrel with the acorn. All quotients are 10 or less. 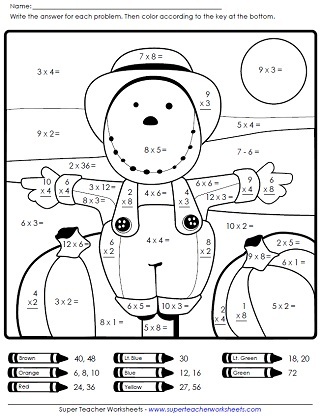 This color-by-number picture has a scarecrow and two pumpkins. Reduce each fraction to simplest terms. Then use the key at the bottom to color the picture. On this 20 x 25 grid, use the plot points to create an apple. This is an intermediate level mystery graph picture with a 30 x 40 grid. Use the plot points to reveal a picture of a squirrel. Printable September calendar. Features an apple tree theme. An alternative October calendar with a boy and a girl scarecrow. Printable November calendar with a squirrel and acorns. Your students will love this November calendar with Pilgrim and Native American. Spooky writing prompts, pumpkin proofreading, scary creature crafts, Halloween math worksheets, and more. Printable turkey crafts, a pilgrim diorama, Thanksgiving bingo game, word search puzzles, stories, and more. Winter graph art project, snowy diorama project, wintry word search puzzles, mid-winter stories, poems for cold days, and snowflake crafts.